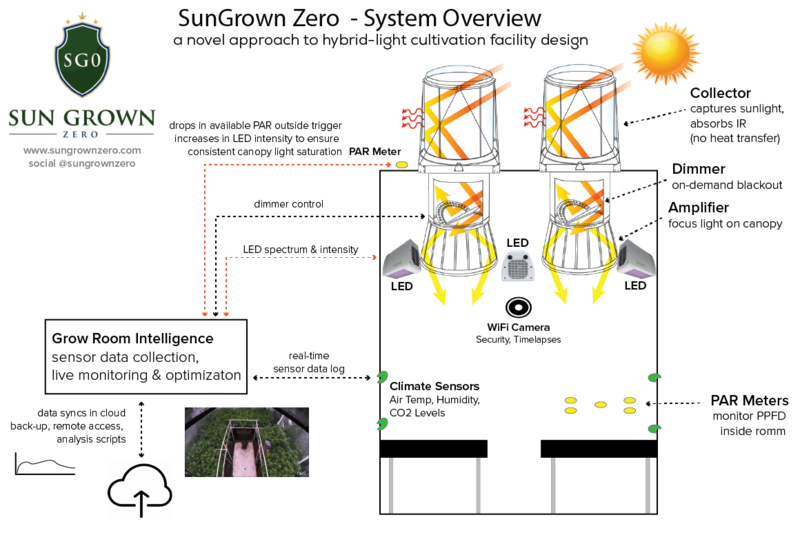 GThe SunGrown Indoor cultivation system is a hybrid-lighting approach to indoor cultivation facilities, using both full-spectrum, natural sunlight and supplemental artificial lights, to drive photosynthesis and healthy plant growth. A hybrid-lighting approach with resource efficient design represents the optimal way to save on production costs, while producing high-quality, premium flowering plants. At the core, the SG0 cultivation system is an integration and optimization of several leading indoor cultivation technologies. The technologies described below are what CCV Research has determined to be the best of breed for each category. Aside from the use of Solatube Daylighting Systems, a custom SG0 system can include different artificial, supplemental lights (including HID lamps like HPS) and grow room intelligence systems. Solatube International Daylighting Systems are at the heart of the SG0 system. For over 25 years, Solatube residential & commerical product lines have revolutionized the way daylight has been brought into interior spaces. They have several patented technologies that set them apart from competitors tubular daylighting devices (TDDs). Solatube Commercial Product Overview (Video). Solatube TDDs are lined with Spectralight Infinity™ tubing, which provides an unmatched 99.7% selective spectral reflectivity. What this means is that every time a light wave or photon bounces off the Spectralight Infinity™, none is lost completely to diffuse reflection and only 0.3% of the light intensity is lost. With this reflective material lining all of their products, Solatube has been able to run tubes up to 100 ft with several 90° angles and still have ample light emitted at the end. Learn more about Spectralight Infinity™ & reflectivity. With a 29″ diameter, the SkyVault series is Solatube’s largest commercial TDD. It delivers massive amounts of daylight in high-volume spaces. Originally designed for high ceilings (30+ ft) found in fulfillment warehouses, manufacturing plants and grocery stores, we have pulled the SkyVault down to the plant canopy for maximum sunlight exposure. The SkyVault Collector with Raybender HD™ technology increases the capture of low-angle sunlight founded in the mornings and evenings, as well as in locations distant from the equator. In addition, this material features selective filtering of the specular light spectrum -ultraviolet (UV) & infrared (heat causing) wavelengths are filtered out. Ultimately, this filtering eliminates the transfer of heat into your cultivation room and reduces required cooling loads. Complete grow room light deprivation is made possible with the SkyVault Daylight Dimmer™. This component uses a patented butterfly baffle design to ensure even light distribution in any position and complete blackout when closed. For photoperiod sensitive plants, maximum control over the amount of available sunlight is an absolute necessity. Lastly, captured sunlight is delivered directly to the intended area with the SkyVault Amplifier™. The amplifier focuses and drives light downward in a smaller, more intense footprint. This creates an even PAR that can penetrate the canopy far better than artificial lights. Coming in slightly smaller with a 21″ diameter, the SolaMaster is Solatube’s most versatile commercial TDD product series. The SolaMaster series is a versatile line of tubular daylighting devices that captures natural light at the rooftop and transfers it into building interiors where daylighting has rarely been possible. These systems feature patented optical technologies that deliver highly predictable light levels, allowing them to be used in commercial daylighting design applications similar to traditional lighting equipment. A wide variety of options allows the potential to design the ideal daylighting system for any space. Learn more about the SolaMaster Series here. CCV Research choose the Heliospectra LX602C Series LED as supplemental lights for two primary reasons: 1) Network Connectivity & Programmable 2) Light Composition Control with independent light spectrum. environmental sensors, data collection and analysis can help reduce wasted labor & time by automatically performing tasks typically done day-to-day by the cultivator. Integration is a start, but unless all elements perfectly in sync – gains are not fully realized. Much like a conductor keeps the symphony in sync, our SOPs and optimization procedures are designed to make sure we are using the latest information and processes to improve the cultivation operation. SunGrown Indoor was developed over two years of R&D by a team of PhD scientists in Sonoma County, Northern California. We collected an enormous amount of light intensity & energy use data in order to optimize the system and ensure we could sustain professional, commercial-level harvest yields. This R&D experience & data has now been utilized to develop light projection models and supplement custom SG0 System design.